Static Batching Check to enable static batching. .NET 3.5 Equivalent A .NET runtime which implements the .NET 3.5 API. 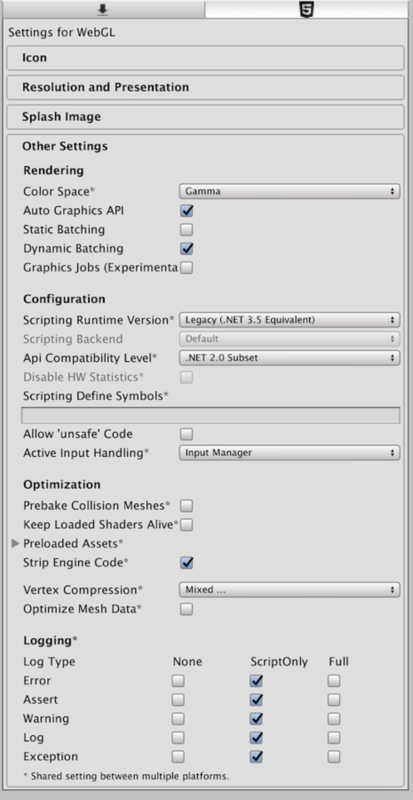 This is the default scripting runtime. .NET 4.x Equivalent A .NET runtime which implements the .NET 4 API. This API is newer than .NET 3.5, and as such, it offers access to more APIs, is compatible with more external libraries, and supports C# 6. Allow ‘unsafe’ Code Enables support for compiling ‘unsafe’ C# code in a pre-defined assembly (for example, Assembly-CSharp.dll). For Assembly Definition Files (.asmdef), click on one of your .asmdef files and enable the option in the Inspector window that appears. Linker Target Specify which build type to generate. asm.js is widely supported across browsers, while WebAssembly is a new and efficient format for the web. Selecting Both generates WebAssembly and asm.js formats. Then at run time, WebAssembly is used if it’s supported by the browser, otherwise it will fall back to asm.js.